This Land Cruiser was made to travel the paths that others have laid down, and to go where no roads exist. It represents the rebirth of a classic 4x4, custom-built with an automatic transmission that keeps you focused on what's ahead. 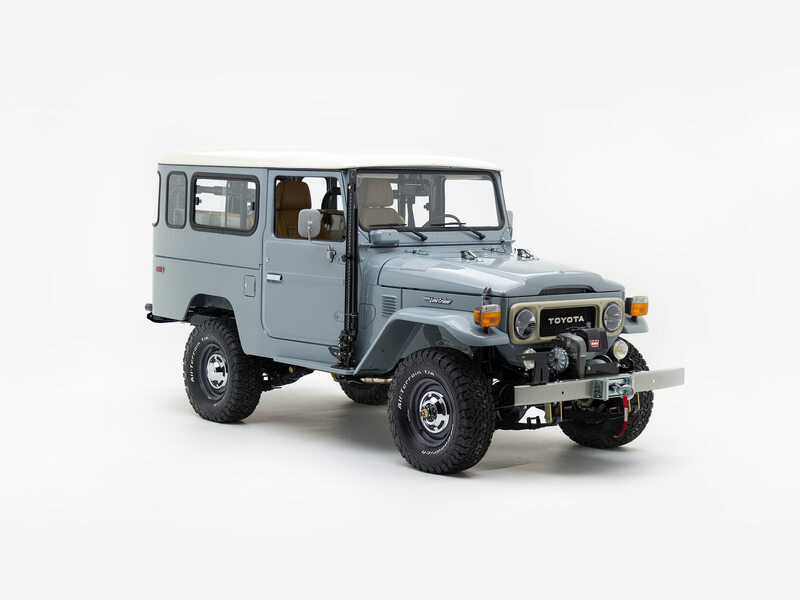 This Land Cruiser’s iconic shape was preserved in the retro-cool shade of Health Gray, while a few carefully chosen accessories accentuate its off-road edge. Classic details add to its timeless look, while LED headlights and heavy rubber ready this rig for new terrains. Ease of Driving? That's Automatic. The original 40 series Land Cruisers were about as refined as the treacherous terrain they thrived in. This build improves upon the stock setup with upgraded mechanical components, like a fuel-injected engine paired with an automatic transmission, so you can concentrate on the trail, and enjoy the scenery. New suspension and power steering bring greater control and maneuverability, instilling driver confidence in any situation. There’s no shortage of character in this classic cabin with its exposed bolts, hand-stitched leather upholstery, and retro controls. It’s all here, waiting to take you back in time. Among these timeless features, you’ll find a few upgrades that bring this Land Cruiser up-to-speed for today’s drivers: premium audio, climate control and yes, Bluetooth®.